To truly understand Lyme disease, you must understand the nature of microbes. This article places Lyme disease in perspective with other known microbial diseases. 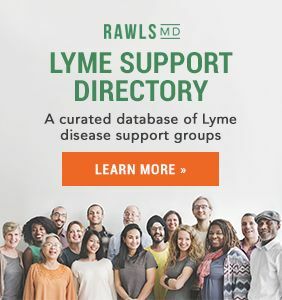 It will explain why Lyme is a chronic infection of not one microbe, but multiple microbes, and why Lyme disease must be treated differently than many other microbial diseases. 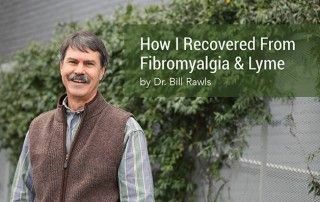 It also provides evidence for links between Lyme disease and other chronic degenerative diseases such as fibromyalgia. Microbes are microscopic living organisms that are invisible to the naked eye. The term “microbe” is very general. It includes mostly bacteria and viruses, but protozoa and certain types of fungi are also often categorized as microbes. Because microbes are invisible, sometimes we forget how pervasive they really are. Microbes are able to thrive in every environment on earth. They are in us and all around us. Everything we come in contact with is contaminated with microbes, including the food we eat, every surface we touch, the people we come in contact with, the air we breathe, and certainly insects that bite us. Most microbes are harmless, but some have potential to cause disease. That potential is referred to as virulence. Virulence defines the ability of a microbe to cause illness. There is no maliciousness involved; it’s purely a matter of survival. Many microbes require a host for survival; certain essential resources and nutrients must come from that host. Different microbes have different strategies for acquiring those resources. Microbes that cause illness in the process of acquiring resources are called pathogens. A highly virulent pathogen survives by overwhelming the host with infection, violently taking what it needs, and then quickly moving on to other hosts. Ebola is the best current example of a highly virulent pathogen. On a virulence scale of 1-10 (where 1 is the least and 10 is the most), Ebola would be a 10. It is extremely contagious and spreads like wildfire. Most anyone exposed will become severely ill. Having a healthy immune system may reduce chances of dying, but it will not prevent very severe illness from taking place. At the opposite end of the scale are the microbes that naturally inhabit our skin and body cavities (throat, lungs, stomach, intestines, genital openings). Referred to as normal flora, these are the friendly bacteria that live in harmony with us. They reside at the lowest end of the virulence scale (about a 1, not zero, because they can still cause illness under unusual circumstances). Our relationship with these microbes is very longstanding and our immune system recognizes them and keeps them in check. They use our resources, but cause little harm in the process. In fact, they often give a little back in return. In between Ebola (10) and normal flora (1) exist a wide variety of microbes with differing levels of virulence. Where they stand on the virulence scale depends on how they are recognized by our immune system and the survival strategies employed by the microbe. As a general rule, the more virulent a microbe happens to be, the less common it is. 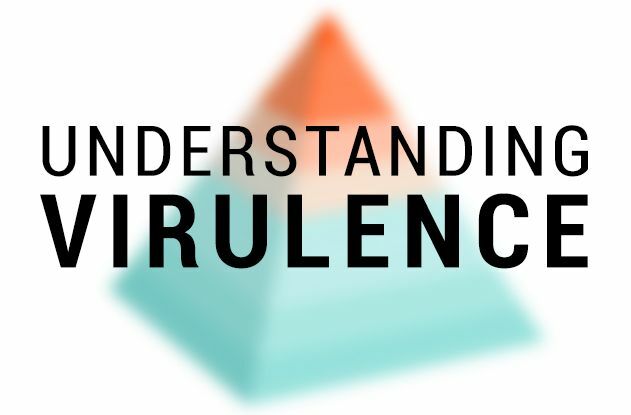 Microbial virulence can be represented by a pyramid shape (see Figure 1). The peak of the pyramid represents the least likelihood of exposure and the base represents the greatest likelihood of exposure. 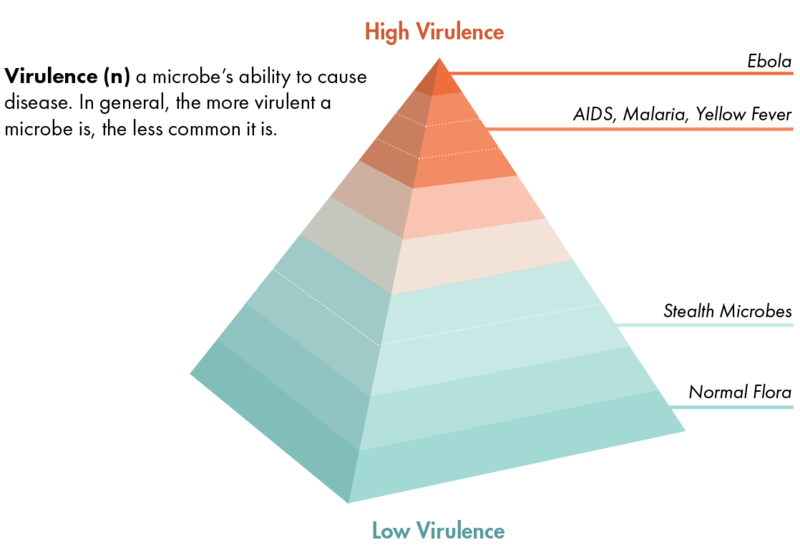 The most virulent microbial diseases such as AIDS, malaria, and yellow fever are found toward the top of the pyramid. These diseases are very threatening, but the average person in the developed world is unlikely to encounter them (except possibly in very rare epidemics or through travel). At the very peak of the pyramid, you will find Ebola virus. Though Ebola virus is very deadly, it is also extremely rare. It only occurs in very isolated regions of the world and sick individuals can be easily recognized and quarantined. The broad base of the pyramid is where you will find normal flora (“friendly” bacteria); everyone is exposed and virulence is extremely low. People are rarely harmed by their own normal flora. Just above normal flora on the virulence pyramid, you will find an assortment of microbes that have lower potential to cause disease, but are certainly not benign either. These microbes are very common; everyone on the planet is exposed to them on a regular basis. Though they rank lower on the virulence scale, they make up for it with persistence. Stealthy in nature; they wait for a crack in the door. If immune function falters for any reason, they can establish themselves as a chronic low-grade infection in the body. Stealthy behavior is a common survival strategy among low virulence microbes. Instead of overwhelming the host with infection, these microbes survive by keeping barely one step ahead of the immune system and staying under the radar. Symptoms occur mostly from the tug-of-war that occurs between the microbe and the immune system. Nonspecific symptoms, such as fatigue, brain fog, joint pain, muscle pain, intestinal problems and feeling flu-like are typical. 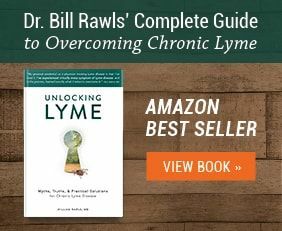 Lyme disease: a prehistoric illness? Borrelia burgdorferi, the microbe commonly associated with Lyme disease, definitely fits into the stealth category. On the virulence scale, it would only be about a 4. It is not new to humans or our immune systems. Borrelia has been infecting ticks and humans for many thousands (possibly millions) of years. Borrelia burgdorferi was isolated from the remains of a prehistoric human, which had been trapped in a glacier in the Italian Alps for 5,300 years. Different species of borrelia are omnipresent in tick populations throughout the world. Borrelia has even been found in high concentrations in ticks on vegetation above the arctic circle in Norway. 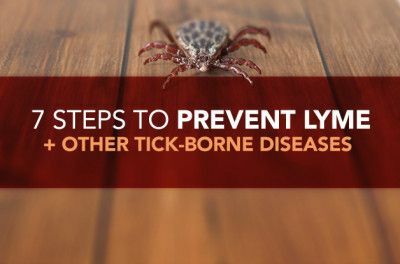 Once borrelia enters the body via a tick bite, it begins evasion tactics immediately. It has to because the immune system immediately recognizes this invader and will be hot on its tail. It clears the blood stream quickly and penetrates deeply into tissues. It does not cause overwhelming infection—ever. Concentrations of bacteria remain low, even in very symptomatic individuals. It grows very slowly. These factors make getting a firm diagnosis a real challenge. For people with a healthy immune system, the initial infection usually ends up being a short-lived low-grade event; symptoms resolve spontaneously. Though taking antibiotics for a couple of weeks after an acute tick bite is a reasonable practice, whether it actually reduces the incidence of chronic infection is unknown. Status of immune function before infection is a more important predictor of who will become chronically ill and who will not. An unhealthy immune system is all that borrelia needs to become established as a chronic infection. Once established, borrelia is very hard to get rid of; chronic infection is a key characteristic of low virulence microbes. Stealth microbes like borrelia are masters at manipulating the host’s immune system. This is not only a survival technique for staying one step ahead, but it is also how the microbes gain access to vital nutrients. Borrelia stimulates chemical messengers to generate inflammation. Inflammation breaks down tissues and frees up nutrients for microbes to scavenge. The insult to the immune system caused by borrelia further intensifies the chronic immune dysfunction (ChronicID) already present. This makes it easier for other stealth microbes to become established. Working together in synergy is another key characteristic of stealth microbes. Borrelia is far from being the only stealth microbe. There are many and they are widely distributed across the planet. The Lyme coinfections are some of the best examples. All of the common Lyme coinfections are stealth microbes residing at the lower to middle portion of the virulence scale. Mycoplasma (about 2-3 on the scale) is possibly the most common coinfection. It occurs in greater than 75% of Lyme cases. Because it also commonly occurs outside Lyme disease, it is actually much more common than borrelia. Virtually everyone on the planet is exposed to some form of mycoplasma during a lifetime. Bartonella, the second most common coinfection, is also more common than borrelia. It is of about a 3 or 4 on the virulence scale. It can be spread by ticks, but is also spread by other insect bites (any biting insect can carry bartonella), bite or scratch of an animal carrier (cat, dog), or ingestion or inhalation of microbe laden feces of infected insects such as lice. Many, if not most people are exposed to bartonella during a lifetime. Next on the list is babesia, a protozoa that is a distant cousin of malaria. It is slightly more virulent than borrelia (about a 5) because it can cause severe illness in certain situations. As you might expect from the pyramid, it is less common than the other coinfections. Ehrlichia and anaplasma, two closely related bacteria, are also more virulent than other coinfections at about 5-6 on the scale. As you might expect, they are the least common coinfections. Asymptomatic infections can occur, but initial infections are more severe than other mentioned tick-borne microbes. These microbes fit less into the stealth category than other coinfections, but chronic infection is still possible. In contrast, Rickettsia rickettsiae, the cause of Rocky Mountain Spotted Fever, is a higher virulence microbe of about 8 on the scale. Most people bitten by a tick carrying rickettsia will get sick. Initial infection with rickettsia causes severe acute illness which can be life-threatening without acute antibiotic therapy. It is not a stealth microbe. After recovery, chronic infection is unusual. Infections are much less common than borrelia or the other tick-borne coinfections. Initial infection is generally a mild event. Chronic infection is associated with vague, nonspecific symptoms (fatigue, brain fog, tingling in extremities, joint pain, muscle pain) that are unrelated to the initial infection. Chronic infection is associated with low concentrations of the microbe in the body; overwhelming infection only occurs if the person’s immune system is severely depressed. Stealth microbes have a slow growth rate. Intracellular – microbes have to ability to live inside cells. Chronic infection with stealth microbes typically responds poorly to antibiotics and vaccines. Symptoms result from inflammation resulting from manipulation of the immune system by the microbes, not as much from direct harm by the microbe. Stealth microbes work together; multiple microbes are the norm. Alone against a healthy immune system, a solitary stealth microbe is not a very formidable force. Simultaneous infection with multiple stealth microbes, however, can be a real problem. Each of the above mentioned microbes uses a slightly different strategy for outmaneuvering the immune system. Several stealth microbes together can cause significant Chronic Immune Dysfunction, which opens the door for chronic infection. In other words, virulence is additive – two or more stealth microbes together can cause significant illness. Chronic Lyme disease is rarely (possibly never) a disease caused by one microbe. 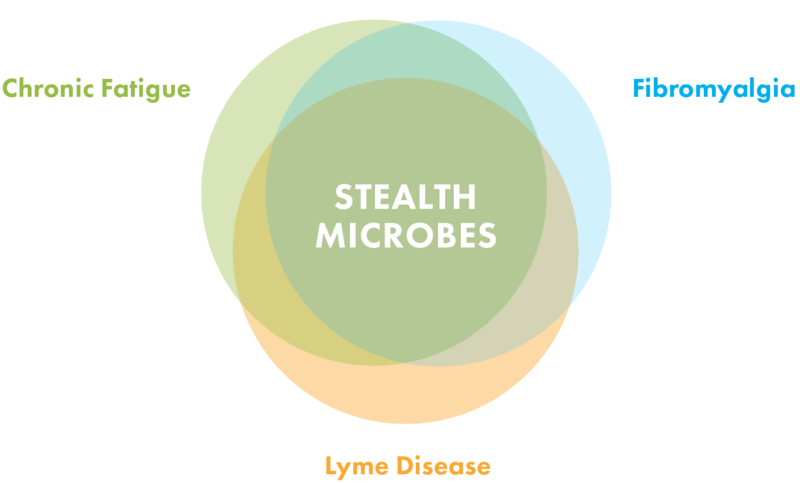 Multiple stealth microbes come together to cause chronic Lyme disease. Infection with multiple microbes does not always occur simultaneously (though it can happen with the same insect bite). A stealth microbe such as mycoplasma or bartonella may be present (possibly for a long time) without causing symptoms. Then a tick bite transmitting borrelia comes along. Borrelia acts as a trigger that accentuates Chronic Immune Dysfunction enough to allow symptomatic chronic illness. Borrelia doesn’t even have to be involved. Coinfections can occur with any of the above microbes without borrelia. Because stealth microbes cause similar nonspecific symptoms, chronic infections with other stealth microbes can look just like Lyme disease. This is where the margins start to blur between Lyme disease and other chronic illnesses like fibromyalgia and chronic fatigue. If you draw circles around the symptoms associated with Lyme disease, chronic fatigue, and fibromyalgia, the circles deeply overlap. The nonspecific symptoms commonly associated with any one of the listed stealth microbes sit right in the middle of those overlapping circles. In other words, the possibility that fibromyalgia and chronic fatigue are also associated with stealth microbes is extremely high. 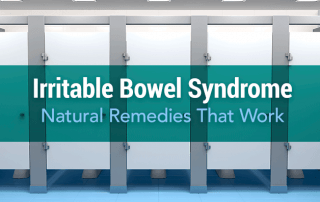 Variations in symptoms depend on the microbes present. 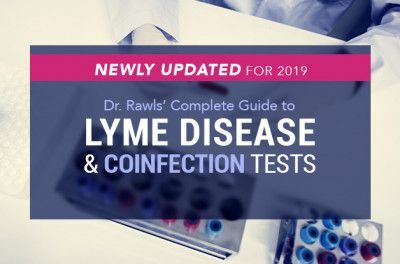 If you think you have all the symptoms of Lyme disease, but the tests are always negative, you may actually have bartonella and mycoplasma… or a different combination altogether. The list of known stealth microbes gets longer everyday, and who knows how many are waiting to be discovered. Stealth microbe possibilities are certainly not limited to those that can be transmitted by ticks. The list of non-tick-borne stealth microbes includes Yersinia enterocolitica, Chlamoydophila pneumoniae, Chlamydia trachomatis, and Campylobacter jejuni, just to name a few. These microbes can also be associated with chronic low grade infection and have overlapping symptoms with other stealth microbes. Though they are not typically spread by ticks, they may be present and not causing symptoms when a tick bite carrying borrelia or one of the other coinfections occurs. Chronic Immune Dysfunction commonly associated with stealth microbe infections can also cause reactivation of dormant viruses. There are eight different herpes-type viruses that infect humans and stay dormant in nerve tissue. Some examples include Epstein-Barr virus (EBV), CMV, and the virus associated with shingles. If you add circles for other chronic degenerative diseases such as ALS, Parkinson’s, MS, rheumatoid arthritis, and other autoimmune diseases, there is still quite a bit of overlap. The possibility that these and many other chronic diseases could be linked to Chronic Immune Dysfunction and chronic infection with stealth microbes is too high to ignore. Chronic disease should be thought of as a continuum. It progresses gradually from a collection of symptoms to a well-defined diagnosis as damage accumulates. 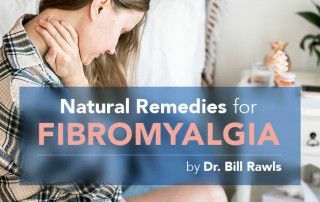 Illnesses like fibromyalgia, chronic fatigue, and Lyme disease are somewhere in the middle of that continuum. With time, most suffers of these illnesses will gradually progress to a more threatening disease such as rheumatoid arthritis or Parkinson’s (if measures are not taken for restoring health). What type of chronic disease a person ends up with depends on the factors that contributed to the initial immune dysfunction, the spectrum of stealth microbes present, and the person’s genetic makeup. 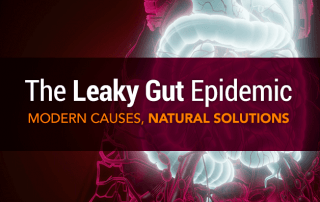 The steady rise in chronic diseases like Lyme disease, fibromyalgia, chronic fatigue, autoimmune, and other degenerative diseases over the past seventy-five years is disturbing, but explainable. The underlying problem is not an epidemic of emerging stealth microbes (stealth microbes have been around for thousands of years), but instead something that we have brought on ourselves. The modern world has become saturated with environmental factors that disrupt immune function. 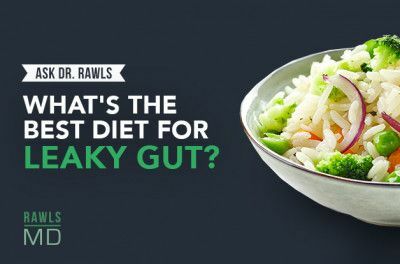 • The vast majority of foods consumed by much of the population of the developed world are heavily processed and artificially derived. • The world has become saturated with toxic petrochemicals and artificial sources of radiation. 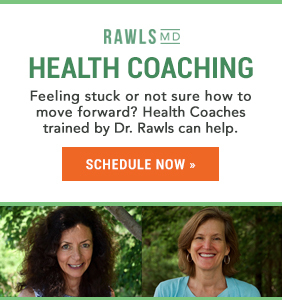 • Oppressive daily stress has become synonymous with modern life. These modern stress factors come together to cause widespread Chronic Immune Dysfunction in much of the world’s population. This opens the door for chronic infections with stealth microbes that otherwise would not have been such a threat. 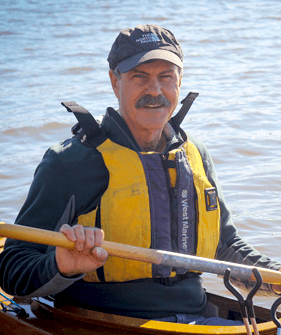 Global warming, increased ticks, and people spending more time outdoors may also fit into the equation, but these outward factors matter less than you might think. Stealth microbes have always been there and they always will be…just waiting for an opportunity! The level of virulence should define therapy. Highly virulent microbes must be addressed with a compatible level of potency. Targeting specific microbes with specific drug therapy (antibiotics, antivirals, vaccines, other supportive drugs) is the best approach for controlling highly virulent microbes. Acute infections such as Rocky Mountain Spotted Fever generally respond well to antibiotic therapy. The Ebola epidemic in Africa has been almost completely controlled with quarantine alone. The classic “identify, target, and destroy” approach that works for high virulence microbes, however, is not a good fit for stealth microbes. First of all, it’s hard to know what to target. Even if one microbe is revealed by testing, the possibility of other hidden stealth microbes being present is much too high to ignore. The very nature of stealth microbes makes them resistant to conventional therapies. Even when stealth microbes come together to cause significant chronic illness, they still retain their individual stealth characteristics. Slow growth, low concentrations of bacteria, and ability to live inside cells and isolated areas of the body dramatically limit the usefulness of synthetic antibiotics. And the ability of stealth microbes to continually alter genetic signature renders vaccines worthless. The best solutions are actually not high tech. Normal health can be restored by creating a healing environment within the body. Minimizing immune disruptors by eating a clean diet, eliminating unnecessary toxins, reducing oxidative stress with antioxidants, managing stress, and exercising regularly is essential for becoming well. Natural herbal therapy is a perfect complement. 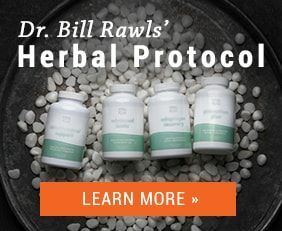 Many herbs reduce inflammation and enhance immune function, while at the same time suppressing stealth microbes. Because herbal therapy is so remarkably safe, it can be continued for a lifetime.